Sippin Cider- Apple Cider by Imaginisce that is...and a GIVE-AWAY! -The variety of patterned papers. -The new denim stickers are fabulous!! -As a cardmaker I love the 6x6 smaller patterned paper pack. What I disliked: -Lack of a good Alphabet Sticker set. That would have made my love for this line complete. The crisp fall colors are wonderful. This fresh look for the upcoming season really makes me want to create with paper. I love this new line and the colors and some of my favorite to work with since fall is my favorite season! 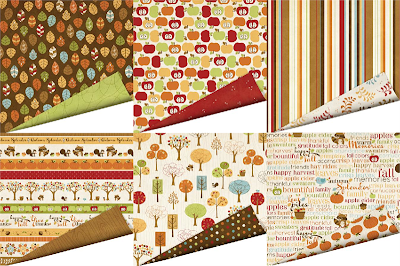 I love these papers for fall, too! I would love to win them and the new i-rock tool. I love to add bling to my cards and L/O's. Thanks for a chance to win!!!! Imaginisce always inspires me to create!! 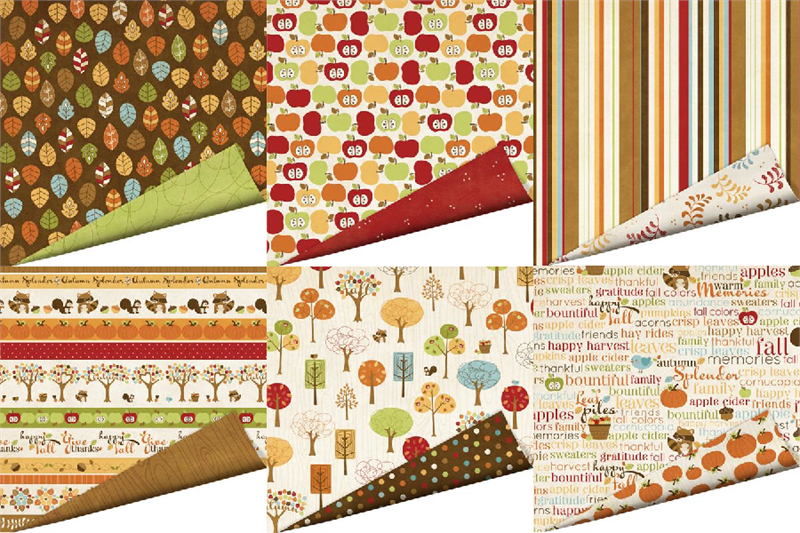 This line would be perfect for those fall inspired layouts and Thanksgiving!!!! Gee, I can't wait to get my hands on this! Love the squirrel and the colors and the overall cute factor of the paper line. Thanks so much! I have to admit that Imaginisce is one of my favorite companies. For this particular line I am in love with the gorgeous fall colours and patterns. The little racoon is adorable. And I love how they've included denim stickers into this line as well! Fall is my favorite season and this is a GREAT line. Finally something that doesn't just focus on pumpkins. AWESOME! You had me a Fall... I love how fun Imaginisce always seems to be & that little raccoon is just to freaking cute! These papers get me in a scrapping mood for fall. I love them. I really like this line! Especially the paper with the little leaves! I think this line is fabulous - it's very versatile and can be used for a variety of different ways. 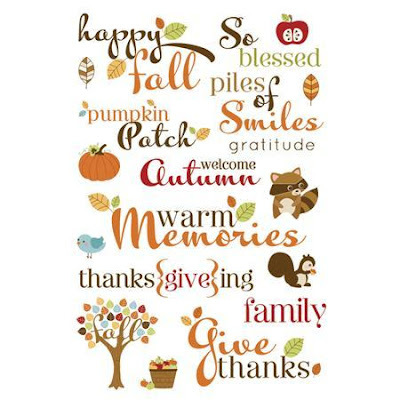 This is pretty, and cute and not too American-specific - I like fall lines but not ones that are too Thanksgiving-y! Autumn is my absolute favourite time of the year! Love, love, love it. And as for Autumn paper? Can't resist them. I adore the look of this line - would love to win!! 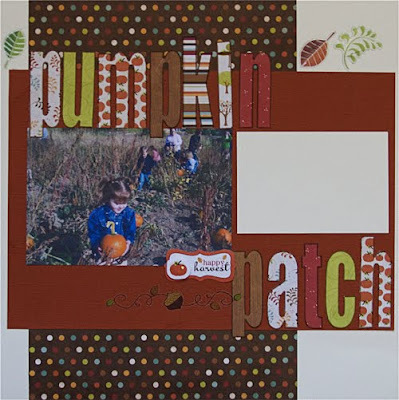 I adore this line, love what you did with the papers...makes me want some apple cider and pun'kin pie! I'm not normally a fan of lines with so many "icons" like the little animals and such. But in this case they're just so cute! And the colors are really great. I adore Imaginisce, they're great both at tools and scrapbooking stash. Their denim stickers looks so good, I'd really want to try them out! I love love love the apple paper. adorable! Fall is my absolute favorite season! Imaginisce really brings it to life with this line. Thanks for the chance to win! I LOVE the colors, the patterns, and the awesome embellishments perfect for reminding us of how special the Fall season is!!! I cannot wait to scrap with these products! I'm ready for fall! I can't wait to get going on my fall LOs and this would be perfect! The colors and prints in this line make me want to spend some "indoor" time creating something beautiful for fall! To everything there is a season! I love anything fall but this line is sooooo adorable!!! Oh I love this release! Fall is my favorite season & that little racoon is too cute! I love this line! Great fall colors. I have been drooling over these papers since the CHA peeks came out. 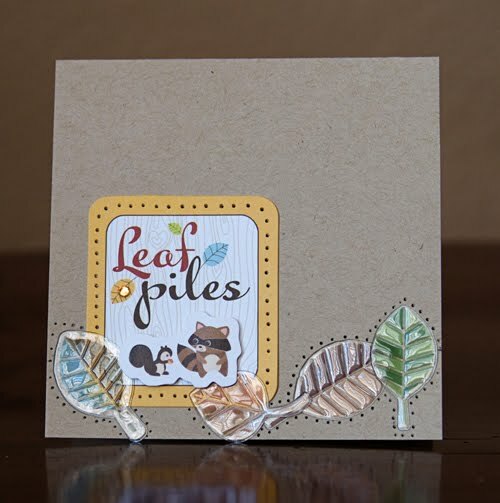 I love the fall colors and just the overall design is wonderful, love love these papers! Just found you on YouTube and went over to FB and "Liked" you. Then I headed over to your site. Love your site. I am now and forever a follower. Super Cute papers. Fall is my favorite time of year. Would love these papers. I am sooooo ready for fall to get here! It's my favorite time of the year, and Thanksgiving is my favorite holiday, so this great new line is right up my alley! I am not daunted by the lack of matching embellies - I can always come up with ways to spruce it up! I just love the Fall. It is my favorite season! Would love to have this beautiful collection! I love the lines that put out the smaller tablet of paper. ThIs would make this line so much easier to make halloween or thanksgiving cards. oh so cute!!! and love what you did with it!! I love this collection! I haven't seen it in stores yet, so I'd love to win it!! Fall colors are always my fave to scrap with....love this line!!! This looks like a really fun collection! I love the colors!!! Love this line - perfect for fall! This is a really great fall line! Love the little animals. Hooray for fall paper! Love the apples especially. I love this line of paper & embellishments! I am ready for fall....and this line is definately right up my ally. So many things to cut out, bright and cheerful...and love that apple paper!! I love this line...especially the tree & apple papers.... Love your cards Ashley!! Your cards are adorable. It sounds like it would be great for making cards and denim stickers, now that just sounds cool. Great fall patterns. Would work nicely for all our fall activities. This is a great collection. The colors the prints, and your projects, very inspiring! Super cute! I would love to win! Love the patterns in these pages!! Love the variety of patterned papers, I really love the one with the trees. Thanks for sharing! I love fall, minus the rain, of course. But, this line is great. I can't wait to get some!!! I love fall and these papers are great. LOVE the colors. Love the look of these papers and stickers. I've got visions of Autumn layouts playing through my mind. Thanks for the chance to win these wonderful products! This line looks so yummy! I love cider! And I love fall colors! This line is supercute! the colors really put me in the mood for fall! And love the cute little critters too! I love fall colors and this line is no different. Great patterns and looks like it will be fun to work with. totally love this line! i love the glossy accents on the paper...it gives it that something extra! i would love some of it in my stash! This is my new favorite fall paper. So super duper cute!